A 500nl bottle, only available in kegs elsewhere, of a beer that is 7.1% ABV and 41 IBU things, and that’d be 213 calories a serve size, and overall this is 2.6 standard drink units. 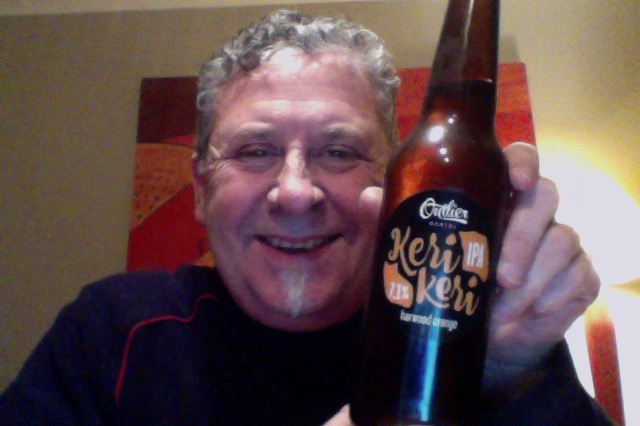 For Outlier Cartel this is a beer in the style of an India Pale Ale (IPA) made in Auckland, possibly in Riverhead at the Brew Fountain, but that’s a guess. This beer changes with the seasons, as should your taste. We juiced and zested a big load of the late ripening Harwood Oranges, and made this beer to remind you what summer tastes like. Enjoy! The Harwood Orange is a New Zealand variety closely related to Valencia. They were grown in an orchard next to Hallertau in Riverhead, Auckland where they brew. That’s a big amount of aroma, matly citrus peppery and rather nice. Pour is much paler than you might have thought, but nice looking with a lovely big and white firm head, not very noisy though. Aroma in the glass is slightly less than when I opened the bottle and is moving towards more a grassy note, and it is still very peppery. Nearly snorted fluff over the keyboard. Rich malty full flavoured nice bitter beer, sweet, and sharp at the same time with a dry finish and lingering mouthfeel. That’s a bit special. This is really nice in the bottle, I can only imagine, because I’ve not had it on tap, that it is spectacular when fresh. I have to get out more. Still lovely even once you get used to that malt middle, the bitterness calms and the dryness fades out to be there but not distracting, still has a great aroma and there is a kick of citrus bitterness to be had. I think it is a thing of beauty. The pdubyah-o-meter rates this as 9 of its things from the thing. I really enjoyed the first half and thought I’d gone to heaven. I calmed down as did the beer for the second half, and enjoyed a way to easy to drink stronger beer that kept itself together and a became a beer that I’m wondering how I’m going to get more of. Where did I get it? The BeerJerk NZ Beer Club, But it’s on keg in some places. Am I enjoying it? It is fabulous. Would I share with a friend on a porch and set the world to rights? This is another of those beers that is slightly stronger but has such character, aroma and drinkability that it’d be magnificent to share with a group. Bitterness and Citrus for the passionate, and just a bloody good of beer for the doubtful. 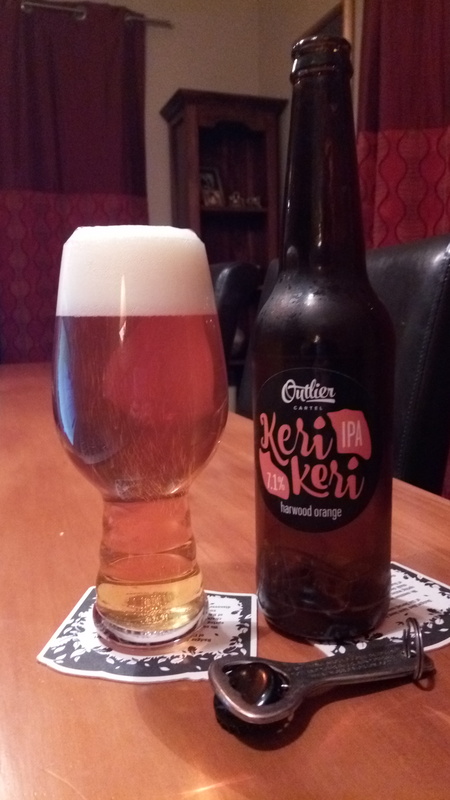 This entry was posted on August 18, 2016 by Philip Walter in Beer, Beer of New Zealand, Beer Review, Craft Beer, Critic, India Pale Ale (IPA), Justsaying, Outlier Cartel and tagged Alcohol by volume, Beer, BeerJerkNZ, craft beer, India Pale Ale, KeriKeri Harwood Orange, Outlier Cartel, Riverhead.